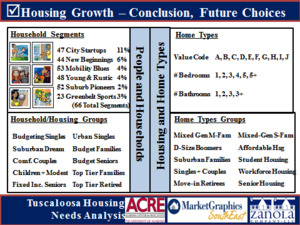 A Housing Needs Analysis for the City of Tuscaloosa was featured at the Alabama Real Estate Summit on August 24, 2012. The April 2011 tornado outbreak caused great losses in Tuscaloosa. Joe Zanola led the research team that delivered the demographic based Housing Needs Analysis. The research team included Zanola Company, MarketGraphics Southeast, and University of Alabama Center for Real Estate. The research included housing needs in the storm impact area as well as the total Tuscaloosa market area through 2016. Special emphasis was given to affordable housing and to student housing. The analysis provided demographic need forecast, detailed home types, quantities, pricing, size, etc. Tremendous merit and opportunity for Tuscaloosa’s housing growth. Segment opportunities discovered to attract sizable employers as well as to identify Tuscaloosa as a growing retiree destination. University of Alabama foreseen to outperform its competition for growth in spite of changing student demographics. Scenario recommended to accommodate University and Census Population growth, to replace lost housing inventories, and to achieve additional beneficial City growth.